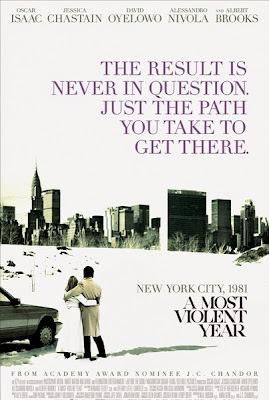 A Most Violent Year is an edgy, brooding and compelling character drama that served as an indictment on the nexus between politics, big business and organized crime, culminating into fever pitch in the winter of 1981; as made amply clear by the title, crime in New York City reached its zenith in the said year. That served as a throbbing backdrop for intensely turbulent few weeks in the personal, familial and professional life of a rising entrepreneur who, anachronistically, has decided to make ethics a key driver for his business – one, ironically, as murky as purchase and distribution of petroleum products. The film’s superbly structured storyline dealt with Abel Morris (Oscar Isaac), the brilliant owner of Standard Oil, in simultaneous grasp of a three-pronged quagmire – chronic hijacking of his oil-filled trucks by a gang of violent assailants; legal proceedings invoked by ADA (David Oyelowo) against his company on charges of financial improprieties, but essentially because it was founded by his wife Anna’s (Jessica Chastain) mobster father; his ambitious purchase plan, through an all-cash deal, of a waterfront fuel terminal which he must close within 30 days to prevent forfeiture, even as his banking partner decides to withdraw financial support. The fact that his icy platinum blonde wife is at direct contravention with Abel’s unwavering moral standpoint – a Michael Corleone antithesis, and the ensuing marital complexities, added a charged undercurrent in this darkly engrossing look at capitalism at its rampaging worst. Terrific storytelling, rich moodiness and atmospherics evoked through excellent cinematography, sustained tension courtesy great pacing, and underplayed performances, made this a gripping and timely tale of an honorable man in the midst of relentless, all-pervading grunge, grime, corruption and savagery.